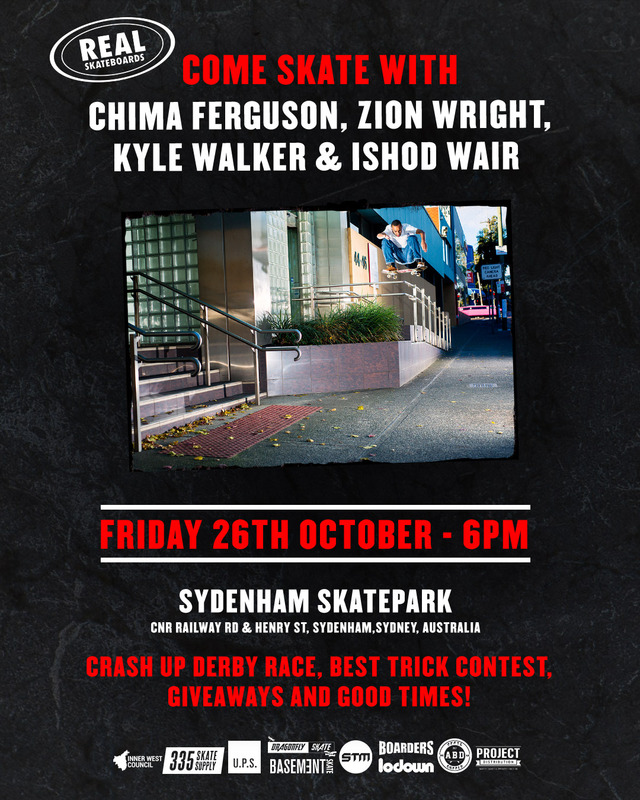 We’re proud to announce the upcoming REAL Skateboards demo coming to Sydney with heavy hitters Zion Wright, Chima Ferguson, Kyle Walker and Ishod Wair. It’s not often Australia gets skaters of this caliber to present a one off demo while visiting the country. Zion and Ishod will be out here for the X-Games, so the Real guys decided to fly Kyle out to join them and Chima for a week of skating in Sydney, culminating in a Demo at the newly built Sydenham Skatepark. 2016 was the last time the Real Team were together in Australia on ‘The Blunder Down Under’ Tour. Sydney skaters will remember that the Waterloo demo was unfortunately rained out, so you know the guys will be hyped to put on a good show for everyone! If you’re anywhere near Sydney, we advise to mark this in your calendar as it will be an epic evening of skating!